You meet the advisor at a social event or through a phone call. He (or she) seems like a friendly, knowledgeable guy. Or a sleazy salesman, in which case you won’t invest anyway. He drives a nice car. You may go to his impressive office. He sits down with you for an hour and gives you free advice about planning for your future. He recommends a long-term savings plan. * You’ll be able to ensure you save regularly, get access to impressive funds and have low fees later on in the plan. They’ll even add to whatever you put in initially! Your advisor is persuasive. You sign the documents and feel relieved. You’re proud that you’ve finally got this part of your life sorted. Maybe he gets out the champagne. Except [insert record scratching sound here] you’ve just signed up for a nightmare. Let’s rewind. Who pays for the nice car, impressive office and champagne? After all, he’s given you all this free advice. Well, you pay for it. The moment you signed, the savings plan company gave your advisor a huge upfront commission. Let’s say you agreed to invest $1000 for 25 years. They will get your monthly investment x half the number of years of the plan – that’s $12,500. If you try to get out of the plan early (and almost everyone does), you’ll never see that money again. So do you think your advisor is thinking about you when he recommends such a plan? No, he is salivating at the commission. Or sweating under sales targets from Head Office. This is why you should not accept free advice from an advisor that is paid on commission. They will not tell you the best thing for you. Learn to invest for yourself or find an advisor that charges per hour or as a percentage of your assets (and takes no commission!). They will be less biased. It pains me that many smart and pleasant financial advisors would be highly recommendable if only they stayed away from these savings plans and offered low cost, flexible platforms. The documentation for these savings plans runs to tens of pages. They are deliberately hard to understand. Clever people have spent a lot of time figuring out how to make money off you at every stage, usually without you noticing. After all, they have to fund the lifestyle of the financial advisors, platform administrators, fund managers and brokers. Some savings plans are worse than others, but in general you can end up paying 3-9% a year. A few percent may not seem like much, but over time these costs will drag down the value of your portfolio. If you are paying 4% a year in fees and the stock market averages 8-12% a year, then you are losing 33-50% of your profit every year in costs. Your advisor may show you how the plan management fees decrease over time – it looks like a great deal. But there are other layers of fees, some hard to spot. The funds you invest in charge a management fee too. Because you are not investing directly in these funds there is a ‘mirror’ fee. Brokerage fees for buying and selling stocks will be in there too. If you had decided to invest your money in a Vanguard passive index-tracker fund instead, the management fee could be as low as 0.08% (plus some minor platform and dealing charges). Your advisor had better recommend some amazing funds to overcome that disadvantage every year. What are these amazing funds? Well they probably aren’t as amazing now as they were last year. Your advisor may have shown you some blistering fund performances and projected a great future from there. Often, people’s savings plans are packed full of gold, Russian and Asian funds, just because they were hot at the time of signing. These risky assets then perform terribly and your portfolio ends up worth less than you invested. Unfortunately, many financial advisors aren’t very interested in managing your portfolio over the years. They got all their commission upfront and now they’re too busy chasing new clients. Advisors come and go frequently, so yours may well have left the company by now anyway. I try to invest regularly, avoid guessing when is best to invest and don’t fret too much if the market goes down – if you’ve got a long time horizon then the market is going on sale! One day you will check your savings plan and realise you have less in there than what you put in. Or you’ll compare its performance to the S&P 500 stock index and notice it did much worse. You’ll be fed up with the costs and the bad investments. You’ll want out. This is when you discover the nastiest surprise of all, one that your advisor probably forgot to tell you about. If you try to get your money out, you could lose up to 100% of it, depending on how far through the plan you are. The exit penalties for leaving these plans are enormous. B) Exit, take a hit and invest the remaining money properly in low-cost funds. You’ll be amazed how lower fees can overcome a big hit to your portfolio if you have a time horizon of 10 years or more. Make a decision as soon as you can. 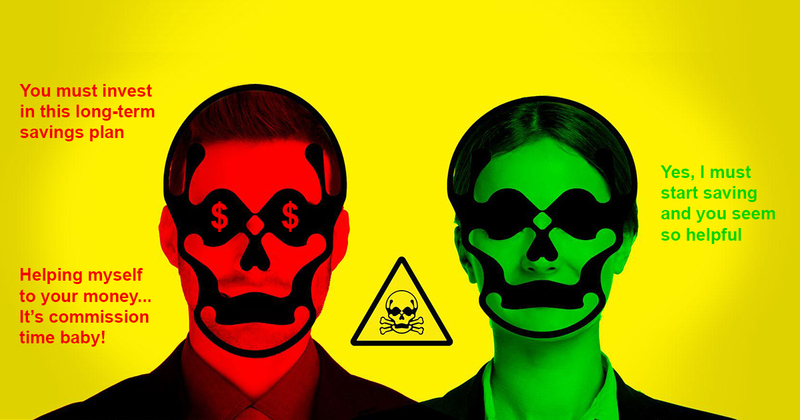 Long-term savings plans are some of the most toxic financial products around. There’s a reason they have been banned in the US, UK and Europe. This article should help you avoid them. Don’t just listen to me though. If you are really thinking of investing in one, go and find 5 other acquaintances from slightly outside your close friendship or work circles, and ask about their experiences with such products. You might be surprised at the number of sad stories out there. If you have already invested in a long-term savings plan, there are ways to resolve your situation. It’s a painful realisation but others in a similar situation can show you the way. If you want some ideas on what to do with your money instead, then join our community here. After all the headaches above, you’ll be pleased to know it can be pretty simple. * It might be an offshore pension or life insurance investment plan instead (or as well!). While these have their uses, I would note that they have the same problems with very high fees and inflexibility. There are always cheaper and simpler alternatives. I have one of these. I hate it and don’t know what to do. I am confused, the company that manages it has a very high staff turnover and I am meeting new consultants every quarter. I want out but don’t even know where to begin. Hi Jolene. Sorry to hear that you have found yourself in this situation. Can you please send some more details using the form on the Contact page? The first thing to do is check what the plan has been invested in and whether that compares appropriately to the mix of global stock markets and what the fees are for each fund. If you want to leave, there will be a surrender penalty but you can usually make the money back fairly rapidly and then zoom past to grow a nice healthy portfolio. Great post. Some well-meaning moron from my company’s HR invited a Dubai Wolfshark company to my office. I was abroad. They left a flyer on the notice board. I printed the above blog post and put it next to it. Thanks Phil! HR teams really need to understand the consequences of letting these people in. Well done for taking action!